It turns out a construction site portable toilet wasn’t the best place to hide from two men who think you tried to break into their truck. Those portable toilets can be so easy to tip over when you’re inside with highly messy results. What can you do with your 12 seconds of video fame? Here’s a (relatively) new site that will give you a chance to find out. Ever had one of those frantic days when you can’t find your car keys when you really need to get somewhere fast? Police say that’s what happened Friday to [a would-be bank robber]. About 6 p.m. Friday, a robber passed a note to a teller at Chase Bank [in Arlington, Texas]… Grabbing money (the amount wasn’t reported), the thief ran outside just before bank employees locked all the doors, Miller said. The robber ran toward a Dodge Dynasty parked nearby. Oops. He had left his keys in the bank. Oh, yeah. And don’t write the “This is a robbery” note on the back of one of your own checks. 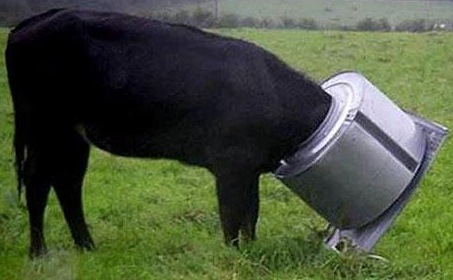 Curiosity got the better of a cow who got its head trapped…washing machine drum. The animal had to be freed by the Royal Society of Prevention of Cruelty to Animals and was fortunate to escape injury. The RSPCA was called to rescue the heifer from a field at Higher Fraddon, St Columb, Cornwall. “It is one of the more unusual things we have had to rescue an animal from,” Jo Barr of the RSPCA said. Yum, yum! Haggis flavored ice cream! Harrods has launched a new range of ice creams with ‘traditional’ British flavours including Yorkshire pudding and Arbroath smokies. The range of 20 ice creams featuring Britain’s best-known delicacies were chosen after a survey of the country’s most popular tastes. Other flavours include clotted cream, sausage and mash, pork pie, haggis, Cornish pasty, Cheddar cheese, Lancashire hot pot, Eccles cake and Kendal mint cake. Need a President’s hip joint? Just check eBay. A Prague lawyer has been granted a pardon after trying to sell what he claimed was the Czech president’s hip joint on e-Bay. Premysl Donat, 54, was arrested after trying to sell the joint which he claimed was given to him by doctors at the hospital where president Vaclav Klaus underwent a hip replacement operation in May. It wasn’t really Klaus’ hip joint. Surprise, surprise! 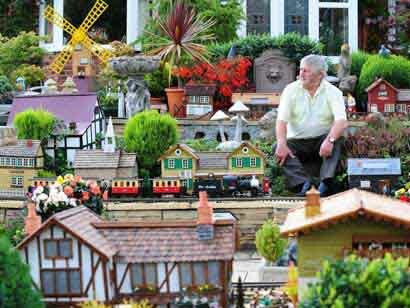 A steam train fan has built a working miniature railway in his front garden. Eric Marshall, 68, spent three years crafting the network which features four trains plus stations, signals, bridges, houses, waterfalls and even a working a cable car. The railway attracts daily coaches of visitors and has raised £500 for Macmillan Cancer Support this year. Careful what you say. You never know who is listening. A Chinese man who swore to God that he didn’t owe money to a neighbour was hit by lightning a minute later. The man, named Xu, made the oath in front of a crowd of neighbours in Fuqing city, reports Southeast Express. He vowed that he had never borrowed money from Mr Huang, who claimed Xu borrowed 500 yuan, the equivalent of £40, from him three years earlier. “He borrowed 500 yuan three years ago from me for a friend’s marriage gift, but he has denied it ever since then,” said Huang, who went to Xu’s home to demand payment. “I told him that if he dared to swear to God that he didn’t owe me the money, then I would waive his debt,” said Huang. Xu made the oath, but was suddenly struck by lightning a minute later. August 29, 2008 Posted by oldstersview | People, Strange	| lightning | Comments Off on Careful what you say. You never know who is listening. Now where’s that rubber duck…oh yeah. It’s in the dog. His namesake was once notorious for biting the head off a bat, but Ozzie the Staffordshire terrier felt less than bubbly when he swallowed this rubber duck. 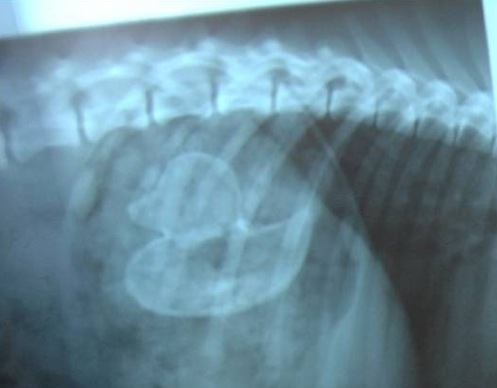 The seven-month-old pooch was play fighting with another dog over the bath toy, but when he began losing he preferred swallowing the plastic prize to giving it up. After a spot of surgery the duck is out and the dog is fine. August 29, 2008 Posted by oldstersview | animals	| rubber duck | Comments Off on Now where’s that rubber duck…oh yeah. It’s in the dog. A pensioner is recovering in hospital after spending eight hours stuck upside down on a wire fence. Kenneth Bain – who is thought to be in his 80s – was crossing a stile on open land near Dornoch in the Highlands on Tuesday night when he fell. He got one leg caught on the top of the fence and was found the following morning by a farmer. Mr Bain was said to be in a comfortable condition in Raigmore Hospital in Inverness. It is the third such incident of its kind in the past two years. This may be the most important medical research story of the year. The gene therapy was performed on mice, whose usefulness as test animals is based on their similarity to human beings. Pancreas cells were induced to produce insulin after being injected with viruses containing insulin-producing genes. The price of rat meat has quadrupled in Cambodia this year as inflation has put other meat beyond the reach of poor people, officials said on Wednesday. 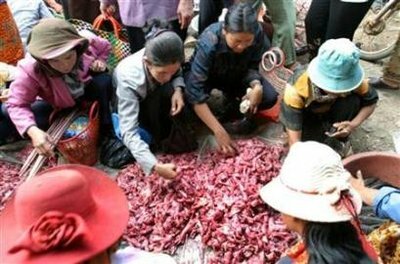 With consumer price inflation at 37 percent according to the latest central bank estimate, demand has pushed a kilogram of rat meat up to around 5,000 riel ($1.28) from 1,200 riel last year. Since the 1990s, a large ‘reptilian’ creature has been sighted occasionally on Umbungi Island in West New Britain, Papua New Guinea. Umbungi Island is located on the south coast of West New Britain between Kandrian and Gasmata. The creature has also been sighted on Alage Island, about 1km to the south of Ambungi Island. August 28, 2008 Posted by oldstersview | animals, Strange	| Barney, dinosaur | Comments Off on Barney? Is that you? Importing racoons wasn’t the only stupid thing Goering did. Hordes of Nazi racoons are out to conquer Europe. They are just across the Channel from Britain after marching through France, Belgium, Holland and Denmark in a furry blitzkrieg. 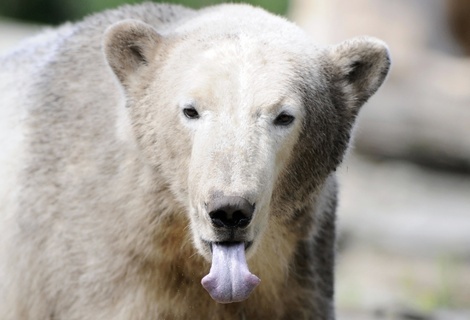 Hitler aide Hermann Goering had the US mammals introduced to German woods in 1934 to enrich the Reich’s fauna. But numbers have soared and they are invading new territory-just like the Nazis did. Germany has more than a million racoons. The racoons have no natural enemies in Europe and are both smart and bold, even coming into houses to steal food. August 28, 2008 Posted by oldstersview | animals	| racoon | Comments Off on Importing racoons wasn’t the only stupid thing Goering did. From time to time I receive “comments” which clearly have either a religious or a political axe to grind and which escape the scrutiny of Akismet. These “comments” will be discarded. While I have no quarrel with anyone expressing their political or religious views, this is not the place for them. Oldster’s View is a brief escape from the serious side of life, and will remain so, and I will not allow it to be hijacked for the promulgation of anyone’s political or religious views. If you wish to express those views in a public forum I would suggest that you begin your own blog. It’s really easy to do. Just go here and you’ll find all the help you need. 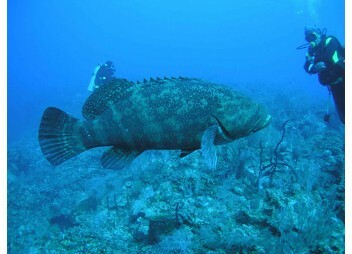 Scientists have long known of the existence of a gargantuan fish species known as the goliath grouper – now they have discovered that it comes in two flavors. The newly identified species will now be called the Pacific goliath grouper. It can grow up to 6 feet long and weigh nearly 1,000 pounds! It is different from its relative that is generally found in the warm waters of the Atlantic. The two species look identical from the outside and thus could not be distinguished before the availability of relevant genetic techniques. Scientists can now deduce that the two differ in their genetic makeup. Buffy led 50,000 women astray. Yeah, right. Hollywood actress Sarah Michelle Gellar’s hit show Buffy the Vampire Slayer, has been blamed for 50,000 women abandoning traditional Western religion to study paganism. The “study” was done in England and published in Women and Religion in the West. The Church of England has no comment. That’s no surprise. 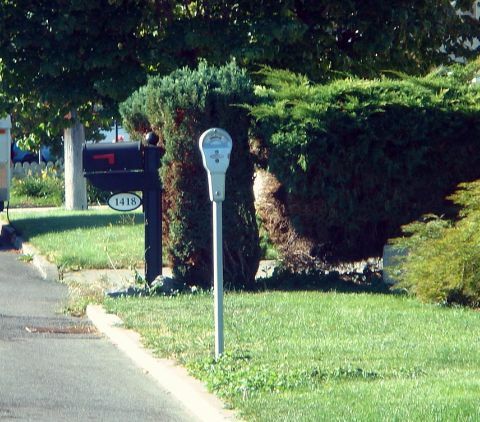 August 27, 2008 Posted by oldstersview | Dumb Stuff, People	| Buffy, paganism | Comments Off on Buffy led 50,000 women astray. Yeah, right. Me? Oh, I just stopped off on this island…for 27 years. A Taiwanese fisherman shocked his family by suddenly reappearing – after being deserted on an island for 27 years. Hu Wenhu, 58, went on a fishing trip to the Indian Ocean in 1981 and stopped at Reunion Island for a short stopover, reports Taiwan Network. With the help of the islanders, Hu learnt French at school, opened a Chinese restaurant on the island and later he even married three times. August 27, 2008 Posted by oldstersview | Uncategorized	| Comments Off on Me? Oh, I just stopped off on this island…for 27 years.